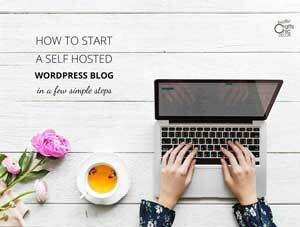 The following post is written by guest blogger, Jane Blanchard. Whether you want to go crazy with white-washing everything, distressing any piece of furniture you can get your hands on, or glazing all decor items in sight in the name of “shabby chic”, we applaud you onward. 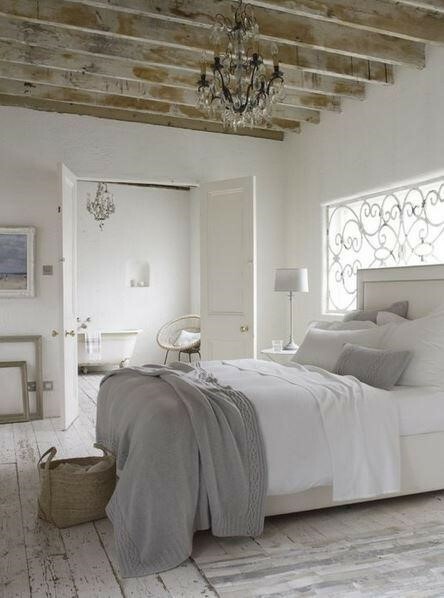 In our efforts to enable you, here’s some inspiration in creating the shabby chic bedroom of your dreams. 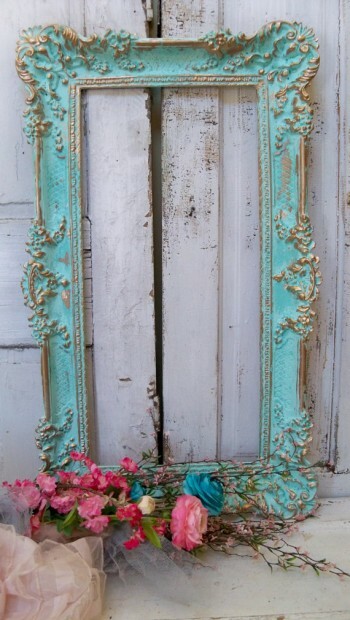 We love the teal that’s been delicately painted on this gold mirror in true shabby chic style, while the flowers are a plush adornment. Chic definition: gorgeous plus practical. Use wallpaper to express your unique quirk. The various wallpapers serves as an accent wall, and it provides awesome visual texture to the room. 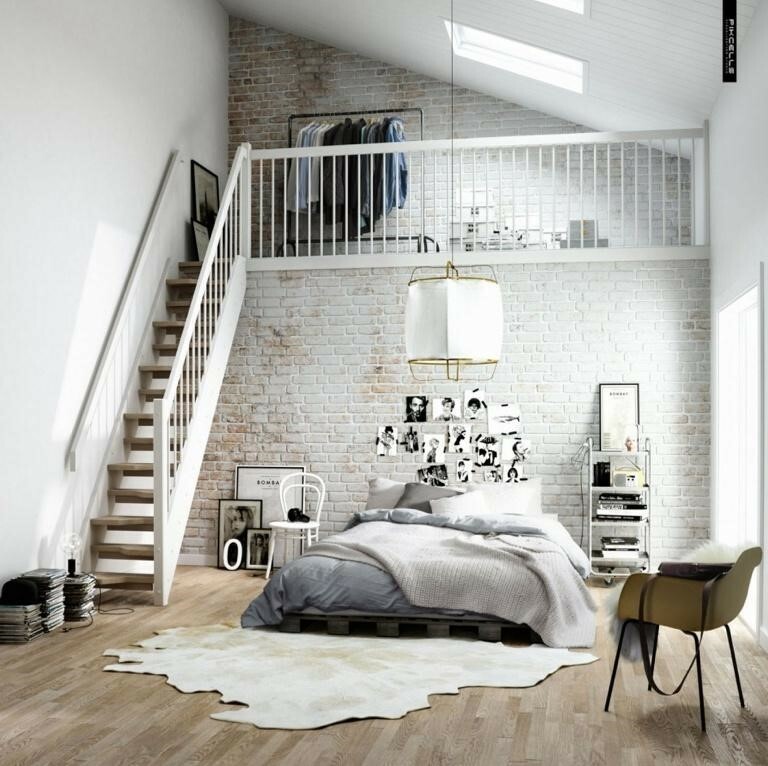 This chic bedroom gets two thumps up! We love and highly encourage the plush bedding. Every piece in this room shouts luxury and comfort, while still pulling off the shabby look with the distressed furniture, glass chandelier, and vintage styled bed. Because we have an eye for taste, that nautical map wallpaper earns extra points in the shabby chic world. The wood panel walls, side tables, and the end bench pull off an elegant, distressed design. Too much, and it would visually clutter the room. Don’t be afraid to revamp that old dresser you’ve had forever. Together in sync now: open mouth, drool, close mouth. Distressed hardwood floors and this open beam ceiling is enough to give this room a 50 out of 10! Other than trying to convince your husband you want to do this to your master bedroom floor, do we need to say more? The new is out and the old is in! Thinking outside the box for a new headboard may be just the touch your project needs. Find old barn doors like these at a local antique shop. Don’t underestimate the power whitewashing. Although it’s one of the oldest tricks in the book, it’s effective. Another exciting, chic aspect in this room, is the bed made out of pallets! Mix and match pieces to create a melting pot of chic decor. 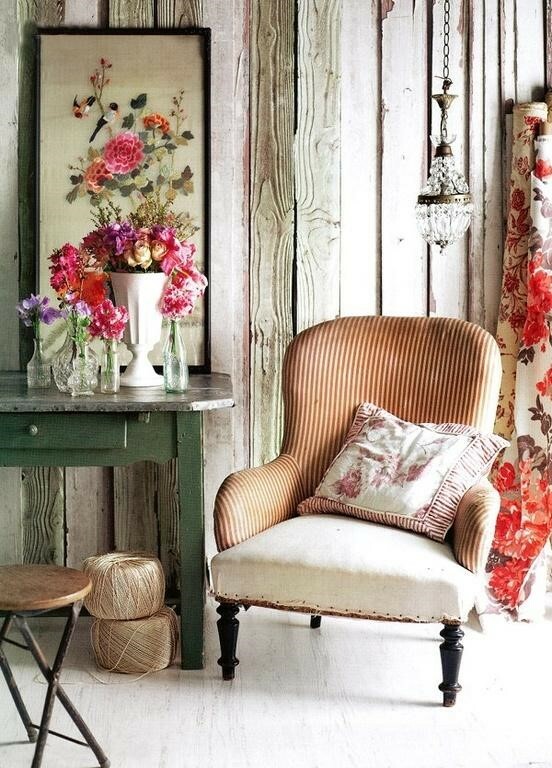 Find an antique chair from a yard sale, some patterned lamp shades, and some bold colored throws and rugs. Voila! 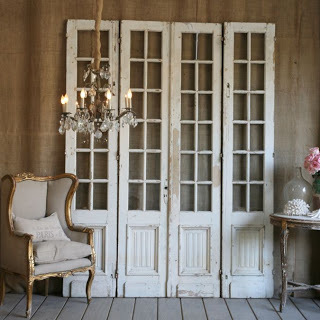 You can’t go wrong with shabby chic. Instead of thinking in the box, expand and tap into the creative flair and streak that can convert your grandma-bedroom to your chic boudoir. For more home ideas and inspiration check out Modernize. Love all theses ideas, just wish I could do them all 🙂 But I especially love the wood beams on the bedroom ceiling. I’ve always loved that idea. I also love the whitewash items. That’s really coming back into style nowadays. These are some pretty fun ideas! That’s one style that I’ve been tempted to try out in my bedroom, but I could never figure out how best to pull it off. I’ll have to give at least a few of these tips a try and see how it turns out. It should be interesting to see how my bedroom looks once I’m done! 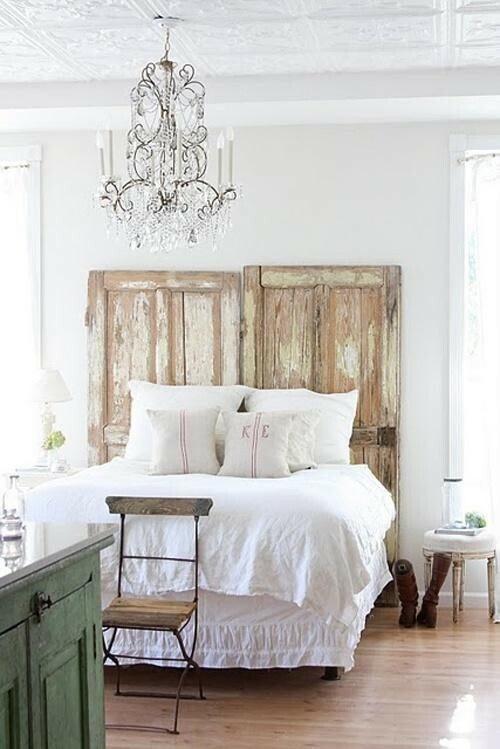 I love so many of the ideas but the head board using old doors with the white linens give an elegant rustic look and feel, I think.